Don’t settle for soggy potatoes. 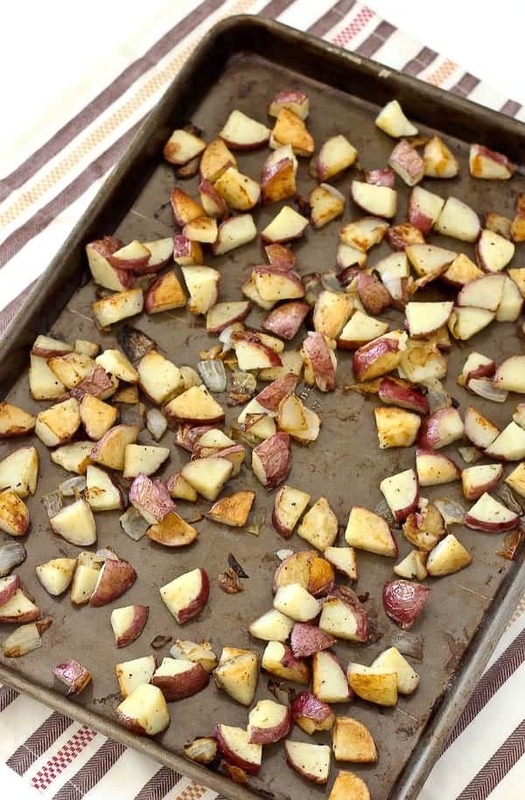 Learn how to make crispy roasted potatoes – it’s SO easy! They’re irresistibly delicious. Crispy roasted potatoes vs. soggy roasted potatoes. One is a clear winner and one just isn’t worth the calories. It’s basically a fight between good and evil. Ben doesn’t love mashed potatoes or baked potatoes but he’s a huge fan of these little roasted guys. He always picks out the crispiest ones. As do I. That’s why it’s imperative that maximum crispiness is achieved. This is serious business, folks. I might even venture to say they are better than fries? 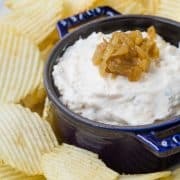 Especially with a dollop of sour cream and a sprinkling of fresh chives. I could have eaten the entire sheet pan of these in one single sitting. I have four important tips for achieving crispy roasted potatoes so that there will be no soggy loners left on the pan. And these tips are completely doable…kind of fail-proof, actually. SOAK your potato chunks in cold water. This removes some of the starch and helps get them super duper crispy. DRY your potatoes. And then dry them a little more. Water = Steam = Soggy = BAD BAD BAD. I use a kitchen towel – but make sure you use one that doesn’t let off any lint. Preheat the oven with your pan in the oven. That way it’s super hot when you add the potatoes and the crisping action starts immediately. DO NOT OVERCROWD your pan. Just don’t do it. DON’T DO IT. If you do, they’ll steam instead of getting crispy. How many times have I said “crispy?” Crispy. Crispy. Crispy. I like to add onions for flavor but you can make these without onions. I really do love the onions though but to each their own! So there you have it. That’s how to make crispy roasted potatoes so that no one gets stuck eating soggy potatoes. They are easy steps to take but they yield a huge result. You’ll be happy you went the extra mile! Can’t get enough crispy potatoes? 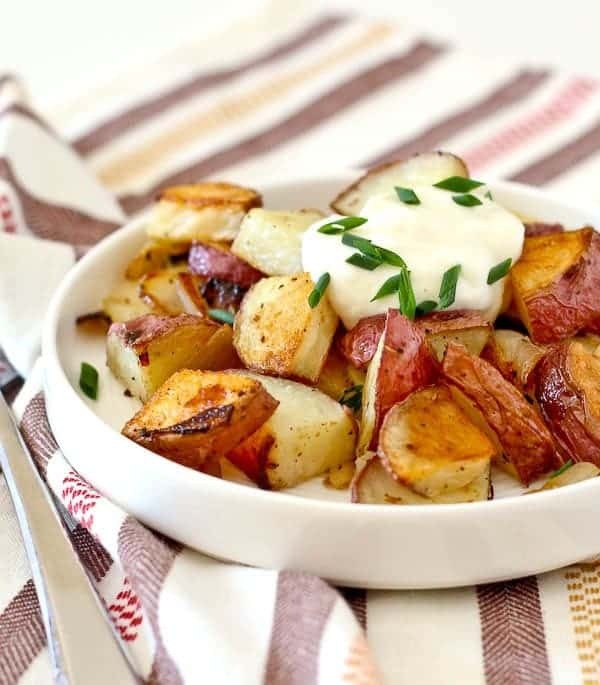 Make sure to try rosemary roasted potatoes and garlic roasted potatoes with paprika. Two of my favorites! Soak diced potatoes in a bowl of cold water for at least 1 hour. Change water if it looks cloudy. Preheat oven to 425°F with a rimmed baking sheet inside the oven. Drain potatoes and rinse with more cold water. 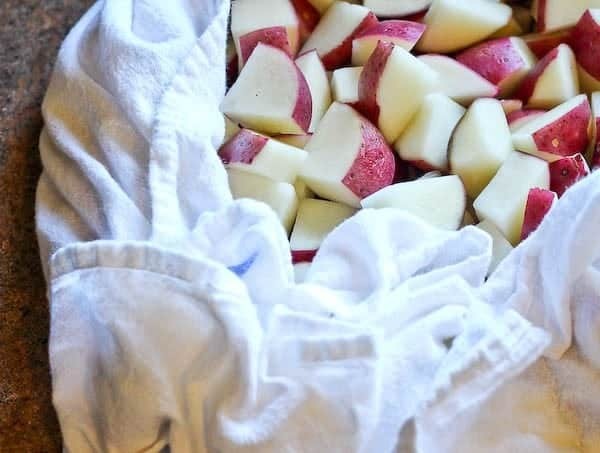 Put potatoes in a towel (one that won’t let off fuzz) and dry thoroughly. Return to a dry bowl. Add oil, salt, pepper and onions. Stir to coat – or use your hands! Carefully remove hot pan from oven and add potato mixture. Spread to an even layer and return to the oven. Cook for 25 minutes. Stir and return for oven for 10 minutes or until golden brown and fork tender. Note: Reheat potatoes in oven or toaster oven for best results. Microwaving will result in soggy potatoes. Verdict: I’m a little obsessed. Was it obvious? Husband’s take: Basically the only way he likes potatoes. Thanx for the tips to make them crispier cant get enough crispy ones BUT I LUV them with ITALIANO (frm Club House) SEASONING!!! Can also add some Garlic salt or powder if u like but really don’t need too! BUT 4 those who will miss the Garlic flavour by all means add it in! Just mix your potatoes in a bowl with your choice of oil 1st. ( i use extra virgin olive oil) then add the italian seasoning! I also sprinkle a little extra on the potatoes once on the baking sheet to make sure they are completely covered with the seasoning. But next time i will def try your steps first! I usually just rinsed the potatoes off don’t soak them and pat dry! so really good tips that will prob make a huge diff 4 me! Thanx Again I’m sure these tips would work for cooking crispier fries as well!! I think these tips would definitely work for fries as well! Your seasonings sound delicious! Thanks for taking the time to come back and leave a comment! Waiting for my potatoes to soak and my meatloaf to bake…I’m looking again at the site that copied your recipe…It isn’t really a copy. She seems to have copied certain “chunks” of your writing and mashed it up with other apparently copied chunks. The blog part doesn’t make any sense, and “her” recipe does not reflect what she has in the blog. So.. she obviously copied some of your writing, but didn’t really break the copyright. Looking forward to the crispy potatoes! I know, isn’t that a strange thing to do? I’ve reached out to her multiple times about it, but she has ignored me. I’ve decided it’s not worth my energy, but it is unfortunate and I so appreciate you taking the time to let me know about it! I hope you love the recipe! Thanks for the tips they are spot on! I know, isn’t that a strange thing to do? I’ve reached out to the “author” multiple times about it, but she has ignored me. I’ve decided it’s no longer worth my energy, but it is very unfortunate and I so appreciate you taking the time to let me know about it! I hope you love the recipe! Oh my goodness!! This is THE best recipe I have ever tried. The potatoes came out crispy! The pre-prep, I think is the key. Thanks so much. Love them! Yes! I’m so happy to hear that! Thanks for taking the time to come back and leave a comment, Deanna! Glad to hear you liked this method! Thanks for taking the time to leave a comment, Mary! Oh yum! That sounds amazing! Thanks for taking the time to come back and leave a comment! I have always wondered how to make my taters crispy…just made these for the first time. Really yummy! Although, I used gold potatoes and did leave them in about 4 minutes more at 425! Perfect! Thank you, Rachel! I’m so happy this method worked for you! Cooking time can definitely vary depending on potato variety and how small they are cut – thanks for sharing what worked for you! Hey there! Do you think I could use a large cast iron skillet instead of a baking sheet? I’m not making very many so in theory they should not be crowded. Thanks! As long as it’s a well-seasoned skillet, I think that would work great! These potatoes were super delicious!! I’m making them again tonight, thank you for the recipe and tips!!! YUM!! I’m so happy you liked these potatoes, Cathy! Thanks for taking the time to come back and leave a comment! These are great. I tossed them in olive oil, Veggie Sesoning (green package in vegetable isle I think), Larry’s seasoned salt and baked as directed. They made excellent steak and potato burritos. Thank! I’m so glad you liked these, Nadine! Thanks for taking the time to come back and leave a comment! Again I SO appreciate you letting me know! Thank you! I’m trying this method tomorrow for a big group. I’d like to prepare the potatoes early in the day. Should i soak all day in the fridge till i’m ready to dry and cook? If not, will they discolor after i dry them in the early afternoon (not cooking them until 6pm). Maybe toss them in the oil and let them ‘marinate’ for the afternoon to avoid discoloration? Soak them overnight in water and then drain and dry well immediately prior to cooking. I hope you love them! 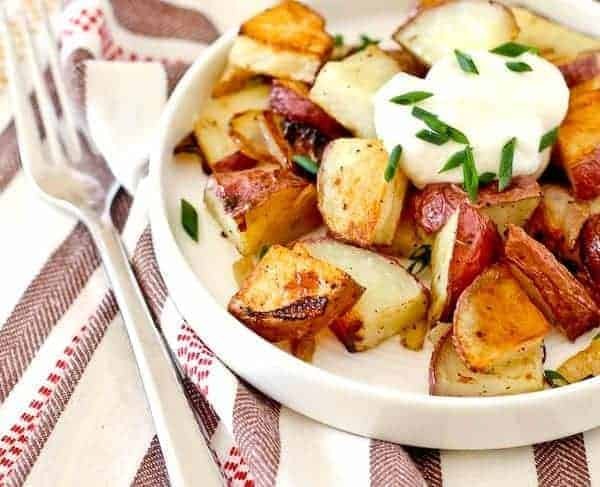 Great delicious potatoes. So easy to make and we loved the delicious flavor!! Thanks for taking the time to come back and leave a comment! I’m so glad you liked these! Are you connected with [link removed]? Recipes are different but I thought it was weird to that almost the same intro/descriptions word-for-word. Just thought I’d give you a heads up. I am not! I’ve contacted them several times about the plagiarism there, but they never respond. I decided not to waste any more energy on it at this point…but it is very frustrating! I appreciate you letting me know about it…and I hope you loved the potatoes! Made these last night to accompany skirt steak. Used mixed color marble potatoes, cut in half. Absolutely fabulous, but they took nearly an hour to crisp—turned oven to convection 425 after twenty-five minutes. Took another 25 min, but the result was worth the wait! I’m so happy to hear that! It definitely depends on how large your potatoes are and some ovens can really vary. 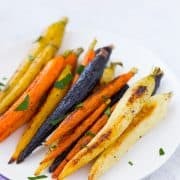 I’ve been loving convection for roasting vegetables and potatoes lately, it makes everything so crispy! I made these tonight! Awesome recipe! I did add some cilantro and thyme because I had it available, paired it with skillet cooked steak. This is def a great dish and your instructions were on point. Thank you! Hi Will! I’m so glad you liked these potatoes! I love your additions…and they’re so perfect with steak! Thanks for taking the time to come back and leave a comment! Hi Shirley, you cook these at 425 degrees Fahrenheit. You could go up to 450 if you want. I was surprised how well your recipe worked. I have Been trying for years to make crispy oven roasted potatoes, and failing. I followed your recipe and added herbs de Provence. My family loved it! Thanks for your recipe. I’m so happy you were pleasantly surprised! Thanks for taking the time to come back and leave a comment! Love crispy potatoes – can they be reheated? Thanks for the great recipe! Absolutely! I recommend reheating them in a toaster oven or the oven to re-crisp them. They’ll become soft in the microwave. You could also reheat them in a hot frying pan with a little oil, make sure to not stir them constantly, let them sit for a bit in one place to get crispy. I hope that helps! Can you use a non-stick spray to make clean-up easier? Forgot to rate it! oops! These were good! Really good! i bought the baby potatoes, cut them in half and followed your recipe, except i baked it at 400. OMG! They were absolutely delightful! Crispy on the outside and tender on the inside. i added a teaspoon of dried rosemary and 2 cloves of minced garlic. Thank you so much. I’m so happy to hear you liked this recipe! Thanks for sharing your adaptations and for taking the time to come back and leave a comment – it means so much to me! I have to admit, I was a little skeptical that they would actually be crispy as claimed but you made a believer out of me! I’ll never roast baby red potatoes another way! That makes me so happy to hear! Thanks for taking the time to leave a comment! Hi, I was looking for a recipe for crispy roasted potatoes. 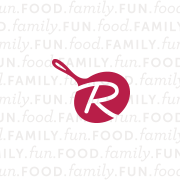 Your site came up and I read your blog and the recipe. I then searched a bit more and found another person’s blog who also had a recipe for roasted potatoes. What was so odd is that the blog is almost identical to yours. Changed a few words here and there, but for the most part, it is verbatim. The website is [link removed]. Just thought this was so strange. A sprinkling of flour makes them even crispier! Thanks for the cold water tip, didn’t know that. Thank you for this!! We did this last night and it was incredible. 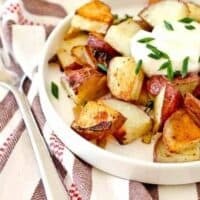 I made a few tweaks due to circumstance that I thought I’d share here to help others like me who may have only googled “how do I make crispy oven roasted potatoes” as they were in the kitchen, holding the knife over the potatoes. When I saw it said at least an hour I said some expletives but then put on my thinking cap :) What we did that worked was cut them fairly small, of course (well-scrubbed too), then put it in a large bowl of icy water to soak, stirring a bit, and then I dumped that, got a splash mesh screen, put it over the bowl, then put the bowl in the sink letting cold water run over it for about 5 min. This did the trick! I very carefully dried them using quilted paper towels (no lint) and proceeded. I would suggest flipping/stirring them in the oven at 15-20 min, not 25, because mine had already started to lightly burn on one part. I think that mid range would be better for uniform crispiness. I did not do onions but if I did, I’d add them at this time as well. This process will be our go-to. Future variations will include olive oil and dry ranch dressing mix, dill, plain old sea salt, garlic & pepper, and honey-sriracha-olive oil. The texture was great and flavor spectacular. Thanks Rachel! Thanks for taking the time to leave such a thoughtful comment! Glad you liked this method! Just cooked this recipe today. It does what it promises: oven potatoes ridiculously crispy and I don’t think I will ever use any other recipe. My onions were also burned but I suspect they added considerable flavour to the whole dish. This recipe also opens lots of chances to add your own seasoning or herbs. Rachel, have you ever tried some rosemary/thyme/etc? 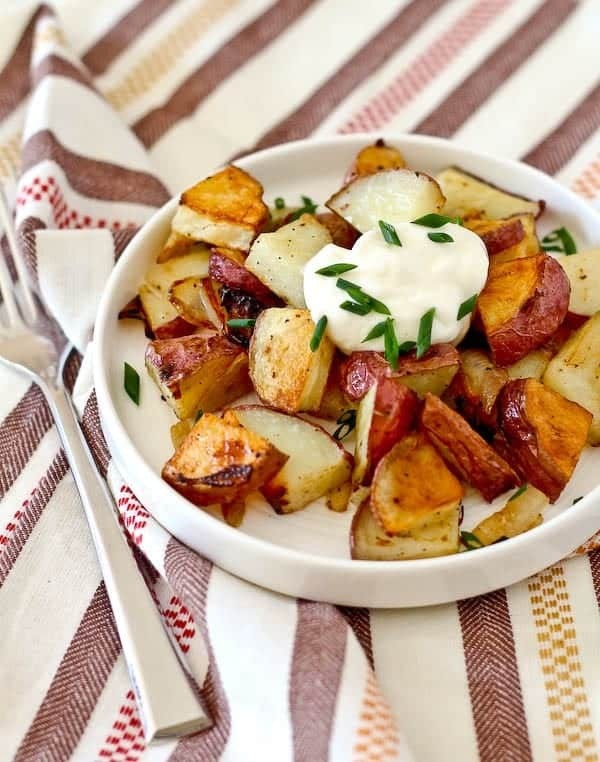 I love rosemary on roasted potatoes! These are really a blank slate — you can put almost anything on them! I like garlic powder and paprika too. I have these potatoes in the oven RIGHT now. The smell is outstanding. If they taste ANYTHING like they smell, I’ll never use another roasted potato recipe!!! 3 more minutes on the timer and then they’re ready!!! I waited to post this until I actually tasted the potatoes so that I could give a rating. The potatoes were definitely crispy! However, the onions were burned. I may use this recipe again in the future, but with modifications (lower temp so onions don’t burn and more spices to give more flavor). Thanks for your feedback, Jennifer! I like the onions a little crispy (maybe I’m weird…I probably am!) but you could also cut the onions into larger pieces or add them partway through the cooking time to reduce the level of crispiness on those onions and still get the potatoes nice and crisp. Thanks again for taking the time to come back and leave feedback! These were amazing. Thank you! So happy to hear you liked them! Thanks for taking the time to come back and leave a comment! Soaking the potatoes is the key to making them extra crispy. It’s also helpful to cut them fairly small. These two things will give your potatoes the crispy roast that is so hard to come by! omigosh ULTIMATE crispy goodness! and I love the onions! great tips!!! Will try this next time! Oh yeah…these beat boring old mashed potatoes any day! Thanks for the tip about cold water soak, had no idea the difference it made. Is parchment paper a no-no here? Will it kill the crispy? That should be fine – just put it on after preheating, not before. Let’s say it one more time… crispy. :) These potatoes do look perfectly crispy! Can I have some for breakfast? What a perfect side dish recipe for Thanksgiving! Love how crispy these potatoes are!